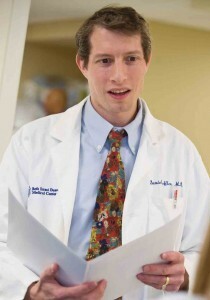 Daniel Leffler, M.D., is director of research at the Celiac Center at Beth Israel Deaconess Medical Center and is an assistant professor of medicine at Harvard Medical School. 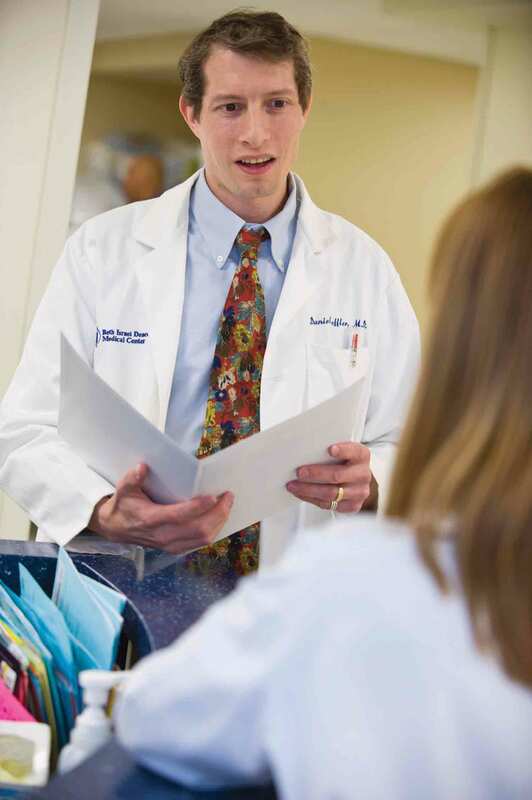 He divides his time between patient care and research in celiac disease and other digestive disorders. A recipient of a National Institutes of Health career development grant, he is also a medical advisor to the National Foundation for Celiac Awareness. He is the co-author of Real Life with Celiac Disease: Troubleshooting and Thriving Gluten Free. In this article, he answers reader questions about the link between celiac disease and diabetes. What are the connections between celiac disease and diabetes? Type 1 diabetes is highly linked to celiac disease on a genetic level, and 5 to 10 percent of people with type 1 diabetes also have celiac disease. Because celiac disease is usually diagnosed later in life, it is most common to have diabetes first. It’s quite uncommon for someone to be diagnosed with celiac disease first and then develop type 1 diabetes, unless the person is diagnosed with celiac disease very young. In contrast, we don’t know a lot about type 2 diabetes and celiac disease. Our group just published a research study that shows those with celiac disease are much less likely to get type 2 diabetes compared to people without celiac disease. This was an unexpected finding and to our knowledge is the first study looking at the prevalence of type 2 diabetes in celiac disease. While we found that people with celiac disease have substantial protection from type 2 diabetes, it’s not clear why. In the general population, type 2 diabetes is much more common than type 1 diabetes, while in celiac disease, it’s the reverse. Should everyone who is diagnosed with celiac disease be tested for diabetes and vice versa? Most of the time diabetes is diagnosed first and the symptoms of type 1 diabetes tend to be very obvious, so there is no reason to go looking for diabetes in those who have celiac disease. It is much more controversial whether we should test everyone with type 1 diabetes for celiac disease. Some studies show some benefit from celiac screening in terms of glucose control, growth and bone health, while other studies suggest that screening offers no significant benefit beyond standard celiac testing when it’s clinically indicated. While we cannot definitively answer the screening question at this time, we do counsel those who have diabetes — and endocrinologists are involved in this area — to be very aware of celiac disease and the link between the two disorders. Keeping a low threshold for celiac disease testing in at-risk populations is a very reasonable strategy. It is also worth noting that the increased risk for celiac disease is not limited to the people with type 1 diabetes themselves but also applies to siblings of diabetics who have the same 4 to 10 percent risk of developing celiac disease. What is the likelihood you will develop diabetes at some point after being diagnosed with celiac disease? The risk of developing type 1 diabetes after developing celiac disease is quite low. It has been theorized that this is because early treatment of celiac disease lowers future risk of other autoimmune disorders, but in reality this is likely because type 1 diabetes has a naturally earlier age of onset than celiac disease. Are there differences in risk factors for type 1 and type 2 diabetes? Type 2 adult onset diabetes is associated with obesity and the metabolic syndrome (obesity, high blood pressure, high cholesterol, fatty liver disease, etc.). It is not an autoimmune disease. Type 1 is an autoimmune disease that attacks the pancreas similar to the way the immune system attacks the small intestine in celiac disease. A few studies had been done in the past by our celiac center and others have looked at body mass index (a measure of weight) in celiac disease. After diagnosis, we see a lot of people gain a lot of weight. This is true no matter whether the person was underweight, normal weight or overweight before celiac disease diagnosis. These studies helped us to focus on weight maintenance early on after a diagnosis of celiac disease. In our latest study this increased weight was not translating into an increased risk of type 2 diabetes. As type 2 diabetes is associated with being overweight and carries with it substantial risks, this was something we were very concerned about. We are not sure why people who are overweight with celiac disease have less type 2 diabetes, but it is good news for those with celiac disease. It would seem the gluten-free diet would be more complicated for someone with both celiac disease and diabetes. What are some tips for managing a gluten-free and diabetic diet? We all recognize it is very difficult to follow two different diets that don’t overlap naturally. It’s incredibly tricky. It requires more nutrition counseling and work than either diet alone and can also take a great psychological toll. A study we did a while ago and a more recent study out of the Netherlands both show increased risk of depression when someone has both diabetes and celiac disease. The combination is difficult to adapt to, so if people are feeling that it’s really difficult, that’s simply because it is. One thing I have found to be incredibly helpful is to find a single dietitian who can help with both disorders. When you bounce from one registered dietitian with expertise in celiac disease to another one specializing in diabetes you can get cross advice. If someone is diagnosed with both celiac disease and diabetes at the same time, should one diet get higher priority than the other? In other words, should you learn a diabetic diet first and then figure out how to incorporate the gluten-free diet or do you have to tackle both at once? This is a difficult question to answer, and my patients ask it frequently. The problem is that the diets interact. If you are doing a great job following the gluten-free diet, the intestine heals and you will absorb better, and this will influence your blood sugar, potentially increasing insulin requirement. If you are following the diabetic diet alone, you will have unpredictable absorption and this will make it difficult to control blood sugar, increasing the risk of hypoglycemic episodes in which the blood sugar dips too low, which can make you very sick. If someone is having unexplained episodes of low blood sugar, undiagnosed celiac disease is a significant cause. Most of the time you have to work with both diets together. The good news, though, is that usually diabetes is diagnosed first and patients have a chance to learn how to deal with that diet alone. Then when confronted with celiac disease, people already have a much better sense of their diet and how to make nutritional changes than most of the general population. While the diet combination is admittedly difficult, people who have been on a diabetic diet have excellent skills to learn the gluten-free diet. They know how to pay attention to what they eat. Those who take the gluten-free diet in stride do very well. Is there any connection between gluten intolerance or sensitivity and diabetes? We don’t know. I’m not aware of a single study of either type 1 or type 2 diabetes and gluten sensitivity. In part, that’s because we have not been able to strictly define non-celiac gluten sensitivity. Until we have a good working definition and diagnostic criteria for non-celiac gluten sensitivity, we will have to wait and see.